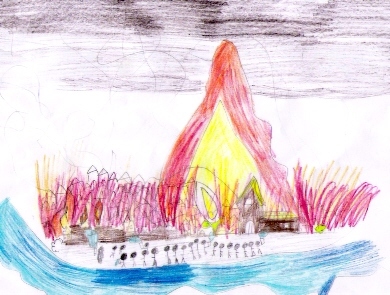 The Great Fire of London poem for kids, by Paul Perro, tells the story of the time, hundreds of years ago, when a fire started in a baker's shop in London, and spread throughout the city. The Great Fire of London is a fascinating story from history; without it, London would be a very different place today. Paul Perro's poem, written in 2009, is fun and easy to read. However it also touches on some of the more interesting aspects of the fire, such as the absence of firebreaks, the indecisiveness of the mayor, the failure of the fire engines, the significance of the wooden buildings, and the heroism of the king. After enjoying the poem, please scroll down a little further to find out some more facts, that will help you discuss the subject with your child for a little longer. Glowed with an orange light. The flames began to spread. He was asleep in bed. There billowed out black smoke. And got them out of there. And called out for the mayor. But they just grew higher. With a big water gun. Fell in the Thames, and sank! Towards the fire and smoke. That the good king was there. The fire died down too. If they were made from bricks. London was a big city in 1666. Half a million people lived there. The houses were made of wood, and the lanes between them were very narrow. 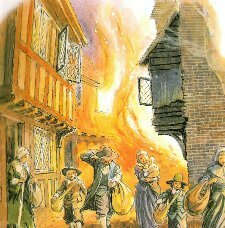 The fire started on Sunday 2nd September in the baker's shop of Thomas Farynor, baker to King Charles II, in Pudding Lane. His ovens were on overnight, making bread, and somehow they caused a fire. In the early hours of the morning the choking smoke woke him up. He rescued his family and ran outside, as the shop burned down. His maid was not so lucky, and she did not escape. The summer of 1666 had been very hot and dry, and the fire soon spread. It is true that several fire engines fell into the Thames while they were being filled with water. It was the diarist Samuel Pepys who realised how great the threat was, and took the news to the king. 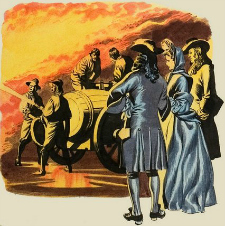 King Charles took command at once, ordering the demolition of houses, and the setting up of fire posts, extra fire fighters, and fire fighting equipment. He even joined in the fire fighting himself. Even with the king's efforts, the fire burned for four days, before the fire-breaks, and the wind changing direction, halted the spread. Amazingly, not many people died in the Great Fire of London. Some people say sixteen, other people say only six. After the fire, the king ordered that London should be rebuilt, with buildings made from bricks and stone. Christopher Wren was the architect in charge. It took ten years to rebuild.